It’s been a while since I made a Waldorf type doll. 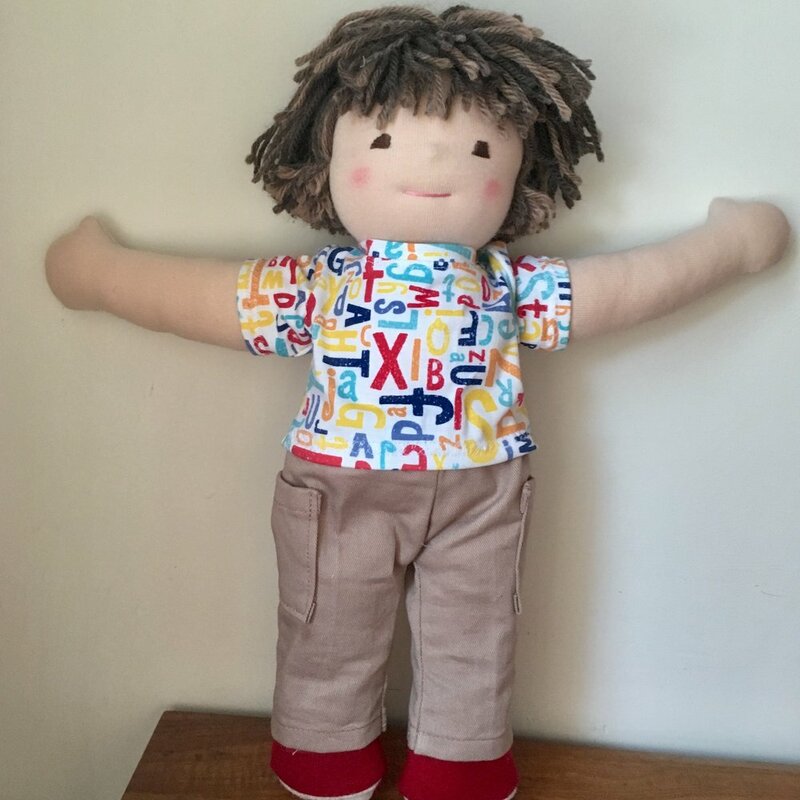 This 12 inch boy was made using pattern for the middle size doll in Maricristin Sealey’s book, Making Waldorf Dolls. He’s a “mini-me” for a little fellow I know. The little boy just turned 3 years old—the perfect age to bond with a doll like this. The red bumper sneakers are new pattern that I designed for this doll. I think they are really cute. He’s gone off to his new home with overalls for play, cargo pants and an alphabet shirt for school and church, and rocket/space jammies. (I drafted the patterns for all his clothes). He has arms that are wide open because I attached them with the seams at the top and bottom of the arm. They would be more relaxed if the arm was turned 90 degrees so that the seam is facing front and back. I like the dolls both ways. It just happened out that Declan wanted to be a doll who welcomes everyone! I think Declan is doing a great job! Notice: This blog is not monetized: I do not use affiliate links. When there are links in a post, they are to give credit to another creative person, because I like or have used a product, or to help the reader easily find supplies for a project.